Leda and the Swan was a popular subject for modern artists, who enjoyed its themes of transformation and seduction. According to Greek mythology, the god Zeus changed himself into a swan to seduce Leda, the wife of Tyndareus, the king of Sparta. 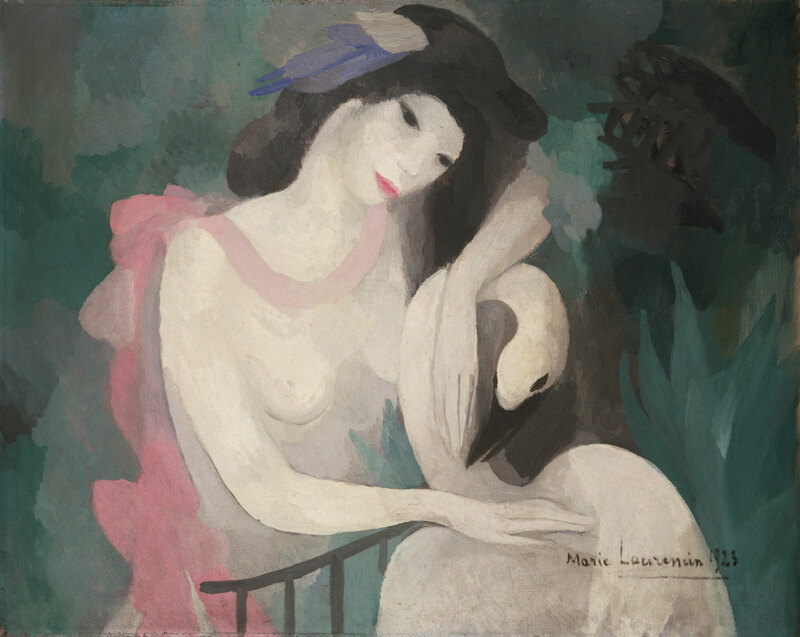 In Marie Laurencin's version, which was influenced by her work for the Ballets Russes in Monte Carlo, Leda caresses the swan's feathered neck and back, yet the black railing that separates them suggests an insurmountable division between the sexes, perhaps reflecting Laurencin's own position as one of the few female artists within the French avant-garde. With Galerie Paul Rosenberg, Paris (no. 758) ; with Galerie Druet, Paris ; Maurice J. Speiser (1880-1948), Philadelphia, by January 1934 ; Speiser sale, Parke-Bernet, New York, January 26 & 27, 1944, lot 93, (illus. ); Charles C. G. Chaplin and Louise C. Chaplin, Haverford, PA, 1944 ; gift to PMA, 1978. 1. See Marchesseau, Marie Laurencin, 1883-1956: catalogue raisonné de l'oeuvre peint, Chino, Nagano-ken, Japan, 1986, no. 234. 2. Information from Parke-Bernet sale catalogue. 3. Exhibited at the PMA, "The Speiser Collection," January 13-February 14, 1934 (as "Figure Composition", 1923). On Speiser and his wife Martha see R. Sturgis Ingersoll, Henry McCarter, Cambridge, MA, 1944, p. 73. 4. Information from curatorial file.